It had been a year since I last hiked the length of the Robinson Creek Trail out of Twin Lakes. It was the first day of the 2011 Challenge and we were heading to Ehrnbeck Peak. There were a number of other nearby summits that I have since regretted not climbing as bonus peaks, the primary one being Center Mtn with more than 1,000ft of prominence. Today I was looking forward to a return visit to climb Center Mtn and a chance to tag a few others as well. I spent the night at the same hideaway we used the previous month along Twin Lakes Rd, near the lower campgrounds. Right next to the creek, it has some shelter from observation along the road and made a very cozy place to park the van for the night. I was up around 6a and hiking through the Twin Lakes Resort shortly after 6:30a. There were only a few campers up at this early hour and no one besides myself on the trail. The sun was up and warming the mountainsides and very soon the bottom of the valley as well. A good t-shirt day right from the start. I passed by Barney Lake at 8a and the Mule Pass trail junction an hour later. I stopped at each stream I crossed to sip a few handfuls of water, a supplement to the several quarts of Gatorade I had in my pack. I paid close attention to Crown Point high on the south side of the canyon - it was another P1K and scheduled for the first day of the 2013 Challenge. There were several interesting, class 3-looking possibilities that I could see on the north side and concluded it would make for an adventurous route worth trying. By 9:15a I had reached the beautiful Peeler Lake. It is a curious lake that sits on the border between Tuolumne and Mono Counties, just outside Yosemite Park. At most times it has the single drainage to the east and Robinson Creek, but during high water it has a second drainage, this one to the west into Kerrick Canyon and ultimately the Tuolumne River. It may be the only lake on the Pacific Crest to drain off both sides, at least at times. I passed into Yosemite NP where I soon crossed paths with a solo backpacker, the only fellow I would see for rest of the day. Though brown with the late summer sun, Kerrick Meadow is still a fine sight after a short threading through the forest. At a trail junction here I turned north towards Buckeye Pass, the first new (to me) portion of trail for the day. Just south of the pass, still within the park boundary, I came across some downed trees that had recently been cleared by chainsaw - evidently someone either needed to brush up on Wilderness restrictions, or perhaps just hoped nobody would notice. It seems unlikely to have been park employees, more likely the packers based out of Leavitt Meadow outside the park. At Buckeye Pass around 10a, I had my first view of Center Mtn to the northwest as well as Hunewill Peak to the northeast. The latter has been on my radar for some time as well, but it seemed doubtful I'd get to that one today. Leaving the trail at the pass, I climbed the drainage on the SE side of Center Mtn for more than 1,500ft over the next hour. Sandy in places, I followed a shady side gully to the South Ridge where I was treated to a fine view of Thompson Canyon to the southwest. Five minutes later I was at the summit of Center, just after 11a. I took photos of the surrounding summits, Ehrnbeck, Grouse, Hunewill and my next objective, Hawksbeak Peak. The terrain between Center and Hawksbeak drops 1,000ft as is covered in primarily coarse sand with some low, scrubby pines and a few easy-to-negotiate cliff bands. The descent off Center took only minutes, with huge plunge steps that are easy on the knees and make one feel like a kid. The climb back up to Hawksbeak with the deep sand now working against me had the opposite effect of making me feel winded and old. 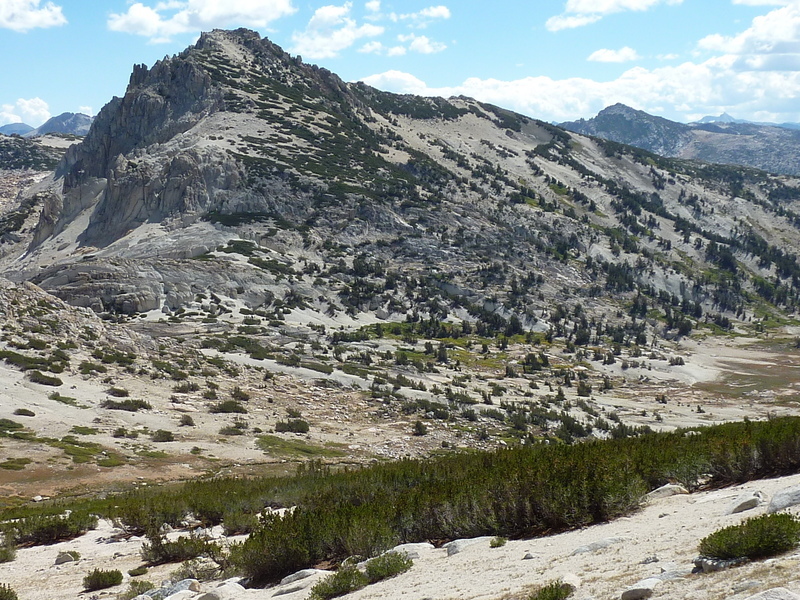 Along with Tower and Ehrnbeck, Hawksbeak sits on the Sierra Crest at the south end of the West Walker River drainage with a fine view looking north into the broad canyon, Kirkwood Lake nestled in the glacier cirque on the peak's north side. There was no register to be found at either Center or Hawksbeak. I next headed northeast, roughly following the park boundary on my way to Grouse Mtn, just outside Yosemite in that direction. The peak is not very high and one wonders why it might have been given a name in the first place, with less prominence than its higher, unnamed neighbor just to the southwest. What it lacks in stature it makes up for in other ways, including some decent class 3 scrambling that was required to reach it from the west. Among the ubiquitous Yosemite granite were some unusual volcanic pinnacles that made for nice scenery, even if not-so-nice loose climbing. There is a spectacular view to the northeast looking down the length of Buckeye Canyon, and the views in the other directions are none-too-shabby as well. The East Face of Peak 10,876ft just to the southwest features near-vertical walls almost 600ft in height. I also found the only summit register of the four peaks I visited on the day. Andy Smatko had left his signature film cannister in 1980 with a handful of additional visitors until MacLeod/Lilley visited in 1994. There were only two other entries since then. I started down the south side of Grouse Mtn (class 2) shortly before 1:30a, reaching the South Fork of Buckeye Creek 40 minutes later and the trail a few minutes after that. Clouds were starting to build up to the south, particularly over Cirque Mtn, a last bonus peak that I hoped to tag on my way back. The peak lies on the broad ridge rising from Buckeye Pass to Hunewill Peak and the even higher Buckeye Ridge to the northeast. Cirque itself is around the same height as Grouse Mtn and not so difficult for a last peak of the day. Luckily the cloud build-up moved towards the west as I approached Cirque, never seriously threatening with rain. After leaving the trail I scrambled up through forest and a mild tangle of brush to the east side of Cirque Mtn, where trees gave way to the usual boulders and talus at the higher elevations. It was after 3:30p by the time I'd made my way to the higher south summit with a sideways view of the Sawtooth Crest to the southeast and a bird's eye view of Peeler Lake and environs to the southwest. I descended Cirque Mtn to the southwest, down a drainage in that direction that emptied into Robinson Creek just below Peeler Lake. The descent was not without some pine-whacking to get through the tangle of scrubby pines covering much of the mountainside. Much of the adventure ended when I finally reached the trail sometime after 4p and began the leisurely descent back to Twin Lakes. It was late enough in the day that all the usual visitors to Barney Lake had already returned, leaving the trail to myself for nearly two hours. It was late in the afternoon, after 6p, by the time I got to the campground and back to my car. The 25 mile outing had taken about 11.5hrs, a good day. I spent the next several hours in showering, eating dinner, and then making the drive back out to US395 and north to Sonora Junction. Just south of the SR108 intersection, I took the dirt Little Walker Rd (excellent condition, suitable to all vehicles) south to Obsidian Flat and then a poorer road further south for another mile to its end, just above Willow Flat. I spent the night at the TH here with plans to climb Walker Mtn in the morning.